StrawHatRequired | Grow food…cultivate joy! This is the last day of February 2017. It is cold and rainy day, with thunder somewhere far away. But there is hope and there is a promise of spring, of renewal and of warmth. There is anticipation of colorful flowers and the dream of multitude of butterflies and the awakening songs of birds and it all is happening around us… Can you hear it? Do you fell it? Let us make this spring unforgettable! I wanted to share with you one of my favorite holidays, which is March 8th also known as the international women’s day. I grew up in Belarus, where this holiday was a big deal. It is a celebration of spring, a hybrid of western holidays like mother’s day, valentine’s day. By that time of the year there were more sunny days and warm, the snow was melting, the birds were busily singing their praises to the coming spring. There was always anticipation and happiness associated with the coming of March 8th. I loved this spring holiday from early childhood. The boys from school would give us small gifts and flowers, it was so awkward for them, but they were so cute and tried so hard to make us feel good. My mom always was excited to see what dad would give her. We exchanged gifts and cards of friendship with the closes girlfriends. I loved getting cards and I was so happy to see smiles or gratitude as my beloved friends would read the cards I gave them. On those cards were pictures and drawings of bright colored spring flowers, I have almost all of those card to this day! There was always sun, love and excitement on March 8th! Friends, I know that each one of us has amazing women in our lives… Let us make this spring unforgettable for them! Let us remember one of those sweet friends we have not seen for years, let us make all women in our lives feel loved, beautiful and respected! Let us send cards to them, give them small gifts, call them, e-mail or ask them to a dinner or share a cut of hot beverage and a cake. Yes it is January. It is cold and the cloud cover is thick and permanent, it is a permacloud! All this dreadful weather is no reason to despair (or at least that is what I am telling myself). The glossy, colorful seed catalogs are neatly staked on my book shelve next to my desk. Yes, you know exactly what I am talking about! Actually it is no more than a month before it is time to start your peppers and eggplants (in zone 6). I need to get going on the planning my 2017 garden. Where to start? Garden planning software and garden outlines are abundant on the internet. I have not used this garden planner but it looks cute and has useful features, for example, it suggests to you when to plant your plants. I am more of an analog person and I like to draw, so my previous garden plans were always neatly drawn on paper (and of course they are in color, because who does not like colorful pencils?). But what happens to this plans when I go to plant in the garden? I plant as I “see” it in the actual garden and not on the peace of paper. Because on the same spot where my neatly drawn plan said to plant a tomato, I see a gray-green leaves of a volunteer catnip plant, and my kitty could use more catnip, right? So I can’t plant the tomato there or can I? Do I move the catnip? But it looks good in here and it is already big and I may damage it’s tender roots…and the frustration begins to add up. So my garden plan always ends up being a total waste of time and energy or a very big frustration and stress. Done! I had enough! I am not doing to agonize about garden plan this year, I garden for fun, don’t I? Also this year I am eliminating or minimizing the areas of my life that cause me stress, and there is no way gardening should be on that list. No way! A hard decision needs to be made soon. Am I going to start some seeds indoors? To grow or not to grow, that is the question! I may do rare onions and some flowers to get an earlier start on the harvest and the beauty. It will be very minimal this year, because every single year the plants that were seeded directly in the garden (or seeded themselves the previous year) outperform the once that were started indoors. Finally I am learning the lesson this year and will seed most things directly. The only problem is that it is so wet in the garden in the spring and I do not want to compact the soil by walking on it. This is it! My plan is to have fun and dream and envision my garden this year. For some reason, even thinking about the words “garden plan” gives me stress and anxiety. I garden for fun, so fun I will have! What are your garden planning techniques? What worked and what made you frustrated about the planning process? What do you do with your volunteers? The silver snowflakes are covering the garden. It is night and all is dark, except the orange street light. The snow glimmers as it moves with the wind, it is a sight unlike anything else… it is snowing. My thoughts wonder, it is so quiet around me and very cold. All is still, all is dressed in a shinny blanket of snow. Herbs add so much flavor to our everyday life. They are full of beneficial plant compounds and most of them are very beautiful plants as well. Purchasing fresh herbs can be very expansive. Also frustrating (at least it is frustrating for me, because they don’t last long…don’t get me started on cilantro and how you get a huge bunch and only need a little and the rest makes it into the compost pile). At this point I hope you want to get growing! Put your straw hat on and let’s do it. I made a little fun diagram to show the visual of what is important to remember. It will work if you want to grow your herbs indoors in container or outside in the garden (if you are growing in the garden – that is your container!). Yes! It is that simple! Containers are very important (ignore this part if you are growing in the garden). Size and drainage are two things you need to remember. Don’t put a large plant in a small containers and remember that roots need to breath, so never plant plants in containers without drainage holes (large once!) or they will drown and rot and die! I personally never fertilize my plants, but sometimes I give them left over herbal tea that I did not finish (it needs to be room temperature before you give it to the plants) same can go for coffee (but most coffee addicts I know never leave any behind). Do not overdo it, especially in containers, remember what you put in that container will stay there – very easy to overdo it, you can be a little more liberal if you grow in the garden. Have fun, start small and enjoy! While you are enjoying the bounty of summer, it is time to plant fall garden! This is your second chance to enjoy the bounty of spring. Cooler temperature and short days are perfect for some crops and there will be less mosquitoes while you work! Some plants prefer cooler temperatures, but die with hard freeze, while others will thrive in cold and will greet frost with improved flavor (carrots, beets, kale and collards). First week of October is average first frost for Athens Ohio (it varies every year). To find the first frost date for your area, check farmers almanac. What can you grow in your fall garden? Now turn off your computer, put your straw hat on and go plant some fall garden goodness! The way corn was grown centuries in America. The idea is to combine corn, pole beans (different from bush beans) and any squash (pumpkin, zucchini, summer squash, and patty pan squash). Corn grows tall and requires nitrogen, pole beans will climb up the corn and they will provide nitrogen in the soil. 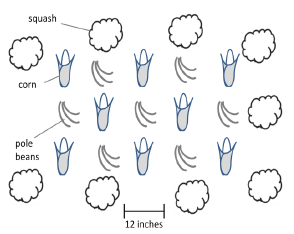 Squash has large leaves which will protect the soil from water loss and weeds, as well as animals who would like to eat the sweet corn. You thought you are the only one who likes it? Grow corn first, plant seeds after soil is warm and no frost is expected anymore. When corn grows to be couple inches, plant beans close to it (couple beans per each corn) and plant squash as a border (any squash or pumpkin will work). Plant couple flowers around: zinnia, marigold, petunias. Above is a simple diagram of how your three sister garden may look. You can make it larger or smaller depending on your space and family needs. Why start plants from seeds? Varieties! There are many more exiting and delicious or plain weird varieties available as seeds compare to transplants. Also you can make sure you get heirloom (vintage) varieties and not GMO. You get what you expect. I have gotten plants from the nurseries that were not what was promised. I got pepper as promised, but the variety was not even close. You save money (you know I am all about saving those greens). It takes you couple of dollars to get from 25 to 500 seeds (depending on the plant). It will take about the same amount or more to purchase a plant or two. Please talk to your friends and your community and try to find seed exchange or swap in your area. 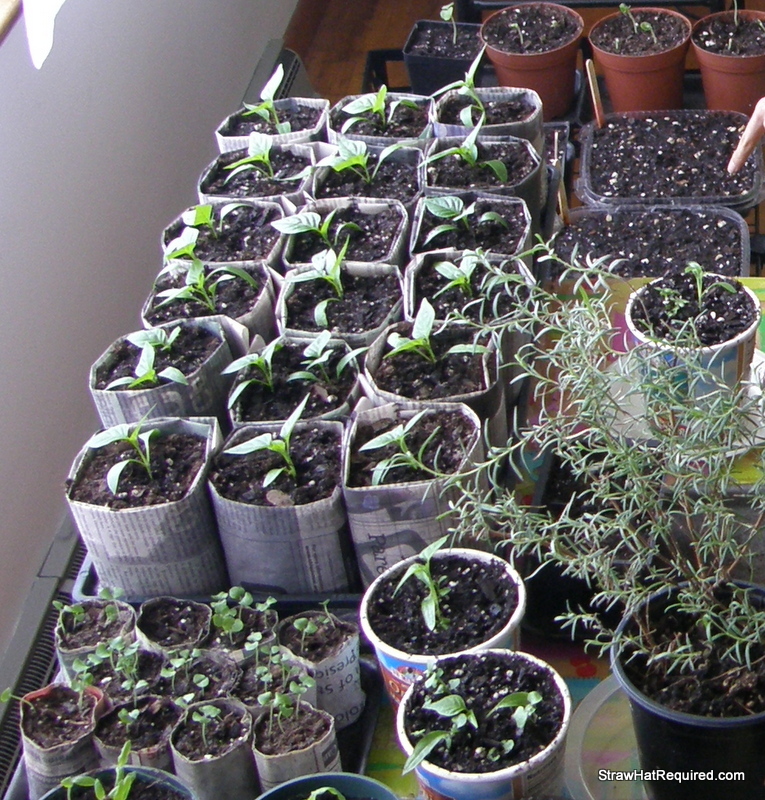 If you can’t find anything like that – organize seed exchange yourself (more on that later). You can see a picture of my peppers and broccoli happily growing in their newspaper pots (learn how to make them here).